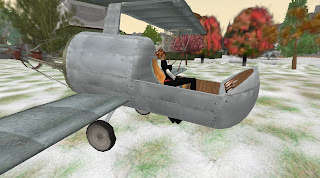 There will be dancing, displays of aircraft, En Garde Fencing, Big Band/Swing music and plenty of company from the SL Bloggers, Royal Caledon Air Force, and Caledonians, some of them overlapping in all 3 groups! 9 Targets have been added to the area near the Quonset Hut. In addition, I've added the En Garde Fencing Game System and have created the Team "RCAF SkyBunnehs"
Eladrienne Laval has joined the RCAF with the full rank and privileges of Flight LT (FLT) in recognition of her many flights and promotional efforts. Diamanda Gustafson has joined the RCAF with the full rank and privileges of Flight LT (FLT) in recognition of her many flights and promotional efforts. Elrik Merlin has joined the RCAF with the full rank and privileges of Flight LT (FLT) in recognition of his many flights and promotional efforts. The RCAF uses callsigns to aid communication over the wireless...Sin Trenton has developed a floating text device for the RCAF that will display our callsigns whilst flying and otherwise socializing at the Connolly Airfield/Aerodrome. Let me know your chosen Callsign as soon as possible, because if you don't create one, believe me - we'll make one up for you. Air Chief Marshal Sin Trenton...."Biggles"
Air Chief Marshal Phineas Messmer...."Liftoff"
Uniforms are now under development from Miss Emilie Watkins - a designer with a great interest in the portrayal of authentic World War One era pilot uniforms. 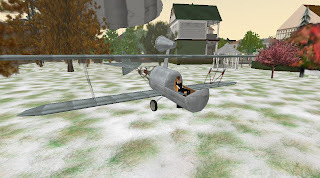 SkyPirates of Penzance (SkyPoP) is a group for civilian aviation enthusiasts of Caledon as well as fellow flyers in all Victorian Steampunk nations. Our base of operations is The Connolly Airfield/Aerodrome in Caledon Penzance. SkyPirates of Penzance (SkyPoP) is not necessarily a pirates group, but is most definitely a group for flying, socializing, and fun! Caledon Morgaine has arrived and is now under construction. Please be mindful of - and courteous to - the terraforming crew as they go about the business of developing our next Caledon Region. Do try to avoid flying into them, landing on top of them, or otherwise distracting them too much. And heavens! No Bombing practice or dogfights whilst crews are working! With the impending opening of Morgaine by Guvnah Desmond Shang, our own Professor Phineas Messmer (RCAF Air Chief Marshal and Aethernautical Society Projects Director) will begin building his launchpad and Lab for Cape Messmer, which will become part of the Connolly-Tombola Aerodrome Complex, and be our first step-stone into Aether-Space. Please be courteous and keep the runway clear of debris during and after use. If you encounter any unresolvable issues, do contact me by Aether-Messenger Device. A few select pilots of the Royal Caledon Air Force were given a copy of the new Boojum Bomber for Flight Tests and Evaluations by Caledon Scientist Denver Hax. I managed a good flight over Penzance, Morgaine, Murdann, and Mayfair. However the landing was not as I planned. I lost altitude too fast ((and ran out of time to stay inworld)) but I managed a reasonable emergency landing at my Park in Mayfair. All in all a successful flight and I was able to walk away from the landing. Always a plus! A special thank you to Denver Hax from all of us in The Royal Caledon Air Force! Thanks for keeping our brave pilots in the skies! Sin Trenton to rank of Air Chief Marshal (ACM) in recognition of his flights, innovations, and exemplary leadership. Phineas Messmer to rank of Air Chief Marshal (ACM) in recognition of his flights, efforts in rocketry, and his upcoming Aether-Space Facility in Caledon Morgaine. I'm told this will be just west of the airfield in Penzance. ACM/Professor Messmer has started a group called the Caledon Aethernautical Society. The Group Charter reads as follows....A special agency of The Royal Caledon Air Force for the purpose of exploring the vast Aether for Caledon. Our Mission: To finish first in the race between Antiquity and New Babbage in the landing of adventurous Victorian ladies and gentleman upon the surface of The Moon. Drake Moyer to rank of Group Captain (GC) in recognition of his flights and recruiting efforts. Pamus Bing to rank of Flight LT (FLT) for her flights and devotion to aviation history. Crap Mariner to rank of Flight LT (FLT) for his flights and continued promotion on his various media outlets. Sin Trenton has developed a floating text device for the RCAF that will display our callsigns while flying and otherwise socializing at the Connolly Airfield. Let me know your chosen Callsign as soon as possible, because if you don't create one, believe me - we'll make one up for you. Uniforms are now under development from Miss Emilie Watkins - a designer with a great interest in the portrayal of authentic World War One era pilot uniforms. She has contacted me and I have full confidence in her devotion to the project. All we need do is give her the time to do it right. General Airfield News....SkyPirates of Penzance (SkyPoP) is a group for civilian aviation enthusiasts of Caledon as well as fellow flyers in all Victorian Steampunk nations. Our base of operations is The Connolly Airfield in Caledon Penzance. SkyPirates of Penzance (SkyPoP) is not necessarily a pirates group, but is most definitely a group for flying, socializing, and fun! The more I explore various places on the grid....The more I settle into Victorian Steampunk. Oh sure! I still get out there, but I don't stay long. I'm at home in Steampunk. But I'll still need to venture out on occasion, if only to use my vast modern-day wardrobe. 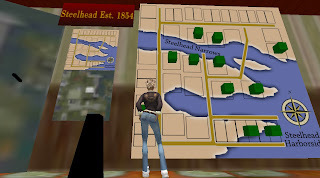 3 parcels in Caledon, 2 in Steelhead Harborside. I'm considering these adjacent parcels as a possible site for The Connolly Telegraph. Once I see the plots I'll determine their best use. My pride and joy! This is a real labor of love! I'm delighted to see the same faces using it again and again. It would seem the same people who enjoy sailing also like to fly. 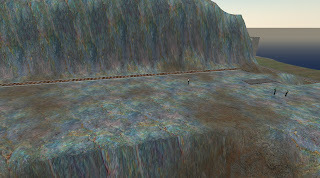 The site of my second lighthouse, previously seen at my former land in Antiquity Cove. My park is at the NW corner of Mayfair, adjacent to my Airfield in Penzance. This will be designed as an outdoor venue and in my mind, a virtual tribute to my parents and their favorite interests (Father=Gardens, Mother=Music). 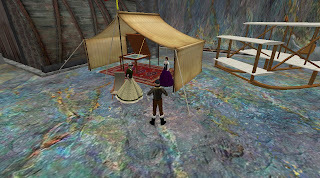 ...and finally...unless a Duchy in Caledon becomes available...this is all I can handle....whew! Recently, I gave RCAF Wing Commander Phineas Messmer authority to build a fleet of rockets for the Air Force. I've also given him permission to create a new organisation dedicated to the exploration of aether-space. Our first mission will be a Journey to the Moon with a safe return to Caledon. We intend to open diplomatic and trade relations with the Lunarians of the Moon before Antiquity and New Babbage make their first contact. 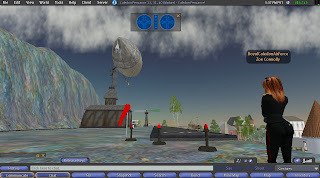 Professor Messmer will create a unique program replete with rocket pilot training that will give these special flyers the skills they need for a challenging and adventurous Moon-Flight. Below are photographs of my tour and inspection of Professor Messmer's Rocket Production Facility in Caledon Penzance. No these are not giant pencils! For the second time in its history, the Cenotaph has been rebuilt. The first was in 1920, when the plaster-and-wood Cenotaph hastily erected a year earlier was replaced with the existing Portland stone version familiar to millions. And now, the Cenotaph has been rebuilt in the virtual world of Second Life. An exact replica of the structure designed by Sir Edwin Luytens for ceremonial use in Whitehall, the virtual Cenotaph is surrounded by a field of poppies representing the sacrifices made by members of the Armed Forces from World War One to the present day....."
Whether circumnavigating Australia, flying from Brisbane to London, or from Brisbane to Cape Town, Lores Bonney heard variations on the same theme: 'This is no place for a woman.' By 1937, she had proved all the naysayers wrong....."
Drake Moyer to rank of Wing Commander in recognition of his flights and recruiting efforts. Phineas Messmer to rank of Wing Commander in recognition of his flights and efforts in rocketry. Sin Trenton to rank of Air Vice Marshall in recognition of his flights, innovations, and exemplary leadership. Air Vice Marshal Sin Trenton...."Biggles"
Sin Trenton has developed a floating text device for the RCAF that will display our callsigns while flying and otherwise socializing at the Connolly Aerodrome. Also, per the Air Vice Marshal's excellent suggestion, and approved by me several days ago, our unofficial RCAF group name will be "Connolly's Crazies" or "The Connolly Crazies." Uniforms will be ordered as soon as I find a suitable designer with the time to work on the project. SLBloggers!.....Hosted by Nikk Huet, our November Second Life Bloggers Party will be held at the new Tribute Island sim on Saturday the 10th from 2:00 PM until 5:00 PM SL Time. The theme will be "Come as you are, or come as you want to be"
Radio Riel will be spinnin' the tracks. Miss Virrginia Tombola and I now own 2 parcels south of the Penzance Mountain that overlook Mayfair. Here we plan to build an aerodrome and pilots lounge area for the enjoyment of aviation enthusiasts throughout Caledon. 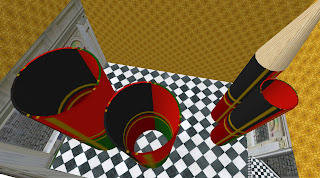 We also invite our friends in other Victorian Districts such as New Babbage and Antiquity. The Connolly Aerodrome is also headquarters for the new Royal Caledon Air Force (RCAF). Squadron Leader Moyer lands a little too close for comfort, but is doing extremely well on his first day of flight training aboard his Nieuport 17 biplane. 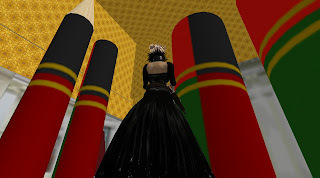 SL News regarding the Second Life Bloggers group: I'll remain your leader. I decided to stay after 7 people consulted with me privately. Special Thanks to those who IMed me in the final hours before I was to transfer power. Second Life BloggerCon 2008 has been shelved indefinitely. I may or may not proceed with BloggerCon. It all depends on venue offers. 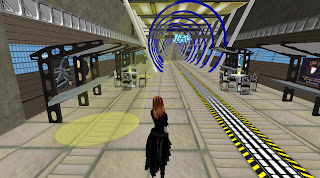 Our Next Blogger Party is Saturday November 10th from 2 PM to 5 PM on Tribute Island. Radio Riel of Caledon fame will be spinning the tracks. This is short notice and no time for a vote among different themes, so it will be a "come as you are, come as you wanna be" party. I'll host the December party at my place in Caledon Penzance known as the Connolly Aerodrome. 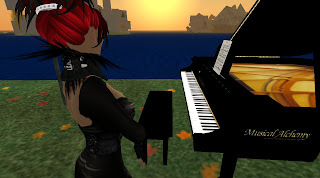 Sunday December 16th from 2:00 PM to 5:00 PM SLT. Radio Riel will also be spinning tracks there for a special Christmas 1944 theme. 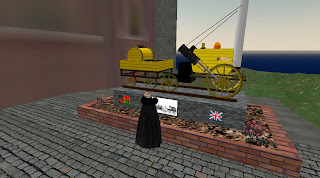 SL News regarding my new parcel in Caledon Penzance. This time I'm building an Aerodrome and organizing the Royal Caledon Air Force. Having new land in Caledon is just too much fun! More setup and tweaking later. I still want to add an observation tower if I can. But my goal is to keep the build prim counts low so we have better flights of high-prim aircraft.